Every year more than 4,400 students from The University of Texas at Austin take their education abroad. As a result, Longhorns are gaining unique hands-on experiences, boosting career competitiveness, and forming lifelong connections. Currently, only six percent of students in the Moody College of Communication are experiencing this once in a lifetime opportunity. We students, as part of the Communication Council Scholarship Taskforce, intend to change that with your help. Our education and career paths are shaped by our experiences. The Moody College of Communication and the Communication Council know that study abroad enhances this experience. Communication is critical for creating a more globally connected world. Together, the Moody College of Communication and Communication Council invite you to support our new initiative, a study abroad scholarship exclusively for communication students. Your generous donation, big or small, will help support an endowment that will ensure this scholarship provides for communication students for years to come. If a financial contribution isn't feasible, we would greatly appreciate if you would share our project with your network! The Communication Council Scholarship Taskforce is currently comprised of Julia O'Hanlon (Former Financial Director), Kennedy Quintanilla (Financial Director), Lydia Medhanie (Co-Director of Diversity and Inclusion), and Riya Ashok (Co-Director of Diversity and Inclusion). In Communication Council, we focus on supporting the College of Communication and its students. Recently, a huge priority for us has been to promote diversity and inclusion initiatives within our college. Upon learning more about the rates at which Moody students study abroad and hearing from Academic Advisors about the struggles that students face when considering these programs, we unfortunately found that there are no existing communication-specific study abroad scholarships. As students who have had the privilege to study abroad, we can personally attest to the confidence, language skills, and knowledge of international practices that studying abroad brings. We believe that financial barriers should never stand in the way of a student getting the most out of their years at UT, so we decided to spearhead an effort to establish the very first Moody study abroad scholarship. The Moody College is a prominent part of the University of Texas, and when more students go abroad and take full advantage of their educations, the whole university benefits. Please donate and spread the word to show your support for Moody students and Longhorns alike! A gift at this level will make a difference by covering the cost of applying to the average study abroad program. This is one of the first financial barriers that a Moody student will face when considering studying abroad, and your gift will eliminate it! 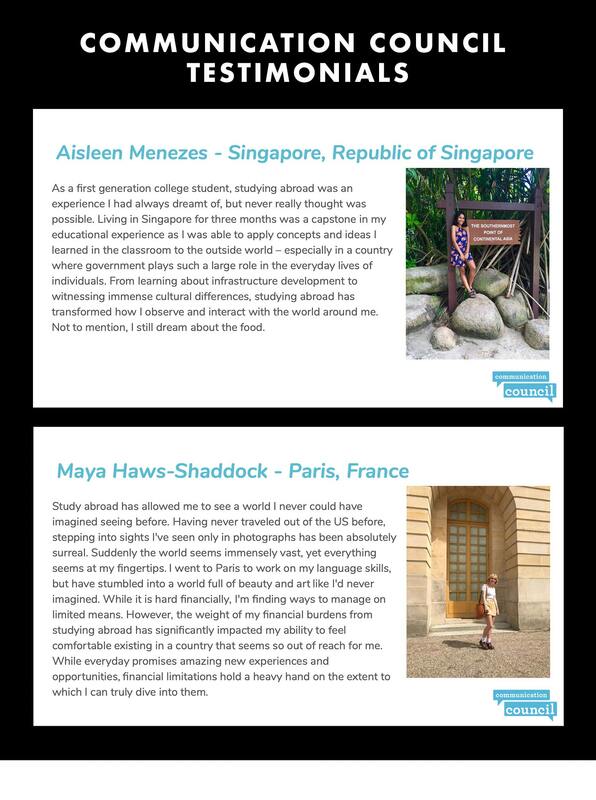 Your gift will help a student get their passport--a tool that will not only allow them to study abroad, but also help them in any future international endeavors! This donation will cover the cost of a student’s medical fees and insurance for the duration of their trip. Because most study abroad programs require students to purchase specific international insurance plans, this gift will be very helpful in reducing the overall cost of the program. 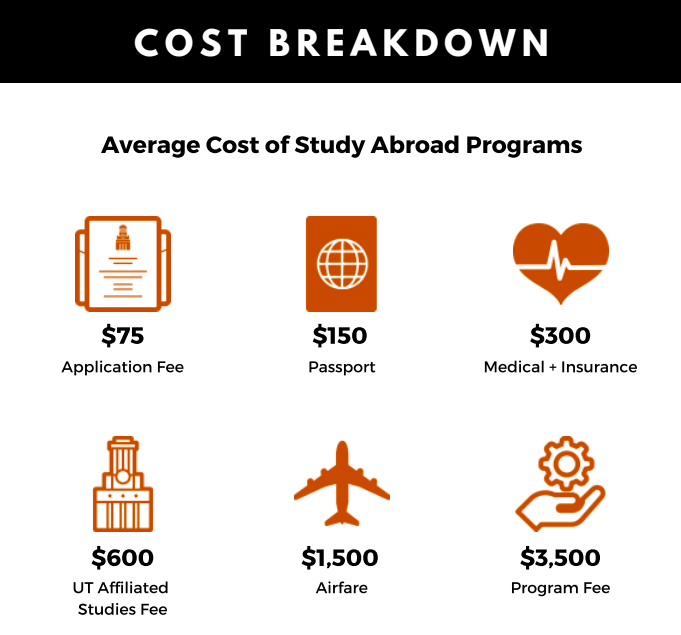 Many study abroad programs, specifically those that are geared towards Moody students, include a UT Affiliated Studies fee. Your gift will help take care of that! A gift at this level will allow a student to book their flights and gear up for their program! With this generous donation, a huge chunk of the fees related to studying abroad will have been covered. This incredibly generous donation will cover the average cost of study abroad tuition! With your help, Moody students will gain access to incredible opportunities all around the world.